Ever since Festool announced they were making a miter saw, the woodworking world went crazy. There have been a few details floating around the Internet for a while now, and even a video or two. But the big news is that we finally have a price. Rumors had the price set between $1200 and $1500, and they were right on the money. The official price from Festool is $1300. 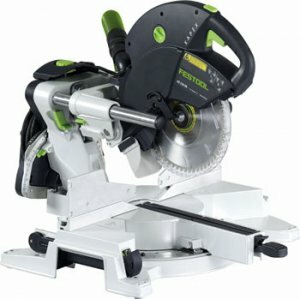 Now $1300 is not cheap when it comes to miter saws, especially for a 10 inch, but when has Festool ever been cheap? People that buy Festools either buy because they want a good high quality tool that will last them a lifetime, or they buy because they think the most expensive tools will make them a woodworker. There are a number of features that set the new Kapex apart from the rest of the miter saw field. You might not be able to notice from the above photo, but the parallel rails that typically side on a normal sliding saw, are stationary. Instead, the whole saw body slides on the rails. This allows for a much smaller overall size. You can basically put this saw right up against a wall, without having to worry about the rails putting a hole in your wall when you slide the saw back. There are almost too many things to mention that make this saw the new top dog, but here are a few more features. The Kapex has a variable speed motor that allows you to set the speed for the type of material you are cutting. The bevel adjustment is completely counter balanced via springs. You can literally adjust the bevel to any angle and the saw will stay there. The saw base is made out of Magnesium alloy, this puts the saw weight at only 47 Lbs. The Bosch and Makita counterparts weigh in at 55, and 48.5Lbs. Sure Its only 1.5Lbs under the Makita, but the fact that it has a number of extra features, shows how well it is engineered.